Two wheels good, four wheels bad is our Parisian transport mantra. 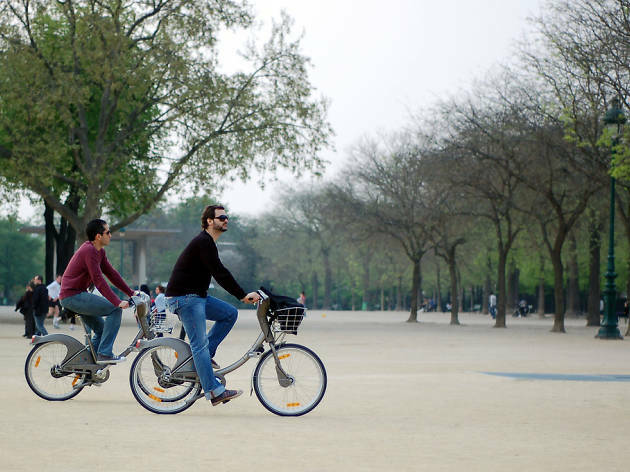 With the wind whipping through your hair, a baguette tucked in the basket and snippets of conversation wafting over from cafés – there is no better way to drink in the city than on a bike. The Vélib system is very efficient and you'll ace it in no time, so for the more adventurous travellers, we've cherrypicked our favourite cycle routes – all of which take in at least three must-do sites and can be adjusted to suit your stamina. Whether you have an hour or all day, pedalling off into the sunset is now as easy as un, deux, trois. 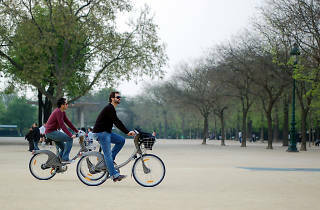 For the most leisurely ride, try out the brand spanking new Parc Rives de Seine. Once only pedestrianised on Sundays, now the wide stretches of road on the left and right banks of the Seine are dedicated to walkers, riders and boarders. Grab a Vélib, pack a picnic and ride until you find a stopping spot which takes your fancy. This is also ideal if you want to take in all the city's main sights, without dealing with cycling on the alternate side of the road. If you fancy (almost) tracing the steps of the Tour de France, start in Les Jardins du Trocadéro, pass under the legs of the Eiffel Tower to reach the Champ de Mars. Cross the river and curve left, cycling until you reach Bois de Boulogne, the 865-hectare former hunting ground which is now home to boating ponds, a racetrack and a children's zoo. Check out our full guide for more post-cycle activities. Begin from Canal Saint-Martin and divert the route slightly to pick up a chocolate and pistachio escargot from star boulangerie Du pain et des idées. Use your sugar high to power through to Bastille and take a left after Opéra Bastille until you reach the Viaduc des Arts. Here you'll have to dismount and lift your trusty steed up the stairs to the Promenade Plantée, a stunning coverted railway overpass which ends up at the Bois de Vincennes, Paris's biggest park. This is for the steel-thighed among you: it's mostly on a steep incline but you can flop at the end, soothing away aching muscles with some of the most beautiful vistas in the city. Start off at Place de la République and head east until you hit rue Oberkampf. Follow rue de Ménilmontant and begin the climb to Télégraphe metro, with plenty of opportunity for refreshment if need be (this area is packed with bobo bars). 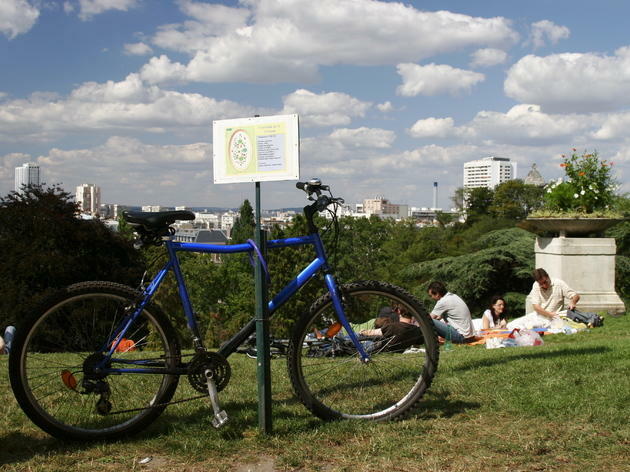 Cycle to the highest point at Parc des Buttes-Chaumont (pictured) before taking some much-needed rest. Bravo bikers! A Parisian path less travelled, this will show off some of the city's more unique areas; kicking off at Porte de la Villette, you'll follow the Canal de l'Ourcq (and the summertime Paris Plages) down to Bassin de la Villette. 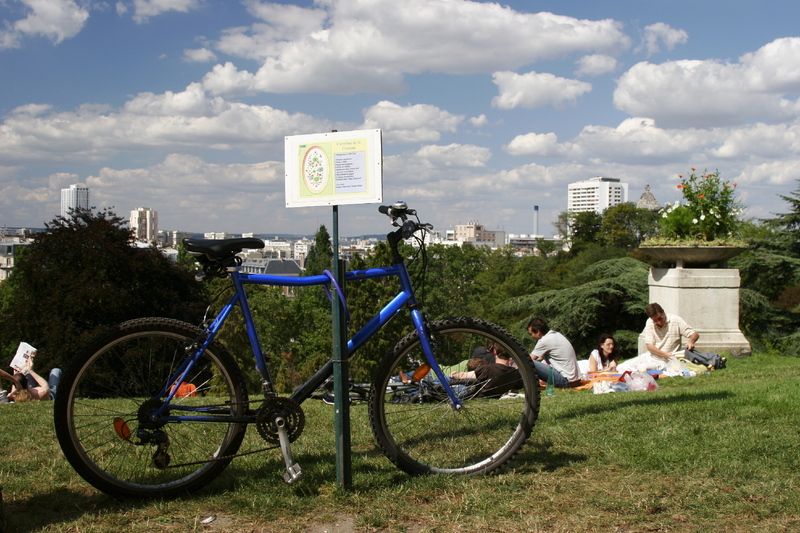 Here take a detour left via avenue Jean Jaurés to get to Parc des Buttes-Chaumont, where it might be a good idea to stop for a picnic or a breather. Find your way back to the water's edge and follow the canal to République, where you're a mere 15-minute zigzag from Père Lachaise Cemetery. Dismount, buy a map from the kiosk outside and begin your search for the dead famous of Paris.